Recurrent hamstring injuries are a major problem in sports such as football. The aim of this paper was to use a clinical example to describe a treatment strategy for the management of recurrent hamstring injuries and examine the evidence for each intervention. A professional footballer sustained five hamstring injuries in a relatively short period of time. The injury was managed successfully with a seven-point programme—biomechanical assessment and correction, neurodynamics, core stability, eccentric strengthening, an overload running programme, injection therapies and stretching/relaxation. The evidence for each of these treatment options is reviewed. It is impossible to be definite about which aspects of the programme contributed to a successful outcome. Only limited evidence is available in most cases; therefore, decisions regarding the use of different treatment modalities must be made by using a combination of clinical experience and research evidence. The aim of this paper was to use a clinical example to describe a treatment strategy for the management of recurrent hamstring injuries and examine the evidence for each intervention. A 26-year-old professional footballer first sustained an injury to his right hamstring when sprinting during a match. Clinically42 and radiologically43 he presented with a grade 2 biceps femoris musculotendinous junction strain (figure 1). Intermuscular haemorrhage tracking around the sciatic nerve was noted. 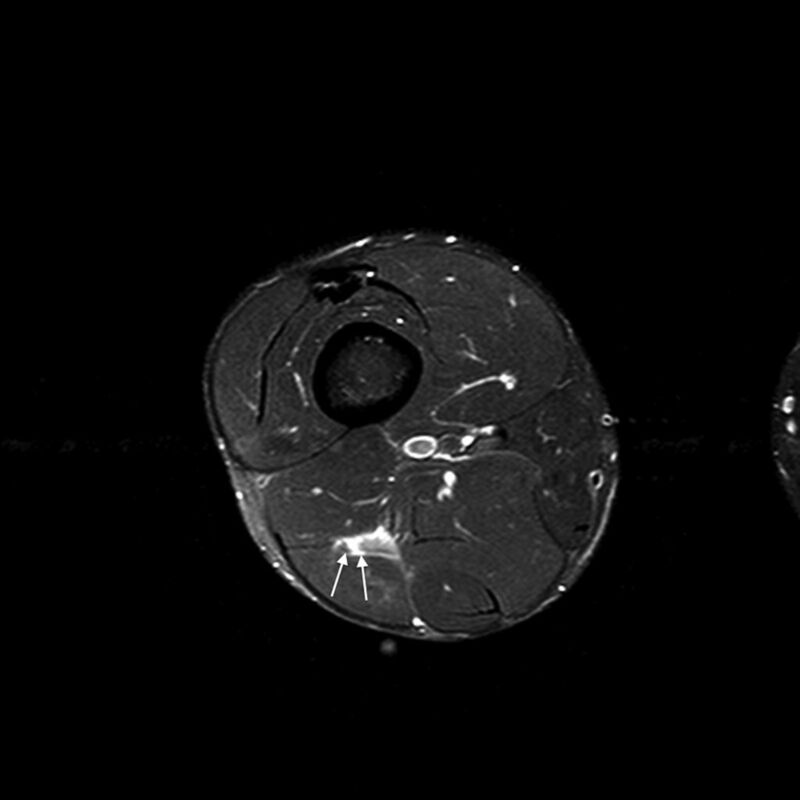 Axial T2-weighted image with fat saturation showing small region of muscle fibre disruption (arrows) reflecting grade 2 injury, involving aponeurosis of long head of biceps femoris. Past injuries included left adductor strain 18 months prior; left soleus strain 18 months prior; left proximal hamstring tendinopathy 17 months prior; right knee grade 3 medial collateral ligament (MCL) tear 16 months prior; right Achilles reactive tendinopathy onset 8 months prior and left adductor strain 6 months prior. RICE followed by soft tissue massage, stretching, core strengthening, progressive agility and neuromuscular control exercises, a graded running programme and an isolated hamstring strengthening programme with specific emphasis on eccentric exercises. He returned to full-team training (RTT) 21 days postinjury, RTP 30 days postinjury and then played the next three games without incident. Two days after his third game, when the player was walking, he experienced a gradual onset of posterior thigh pain. Clinically, he presented with a grade 1 hamstring strain that was MRI negative. He RTT 7 days postinjury and RTP 16 days postinjury, playing a full game without incident. The player then went on holiday for a month which involved long periods of travel, sustained sitting and minimal exercise. On returning to preseason training, he complained of ‘tightness’ in his right hamstring from the second day of training, worsening until day 5 when he was withdrawn from training reporting more intense discomfort after kicking a ball in shooting for goal. Clinically, he presented with a grade 1 hamstring injury that was confirmed on MRI (figure 2) to be more medial, towards the epimysium and not continuous with the scar tissue from the initial injury. 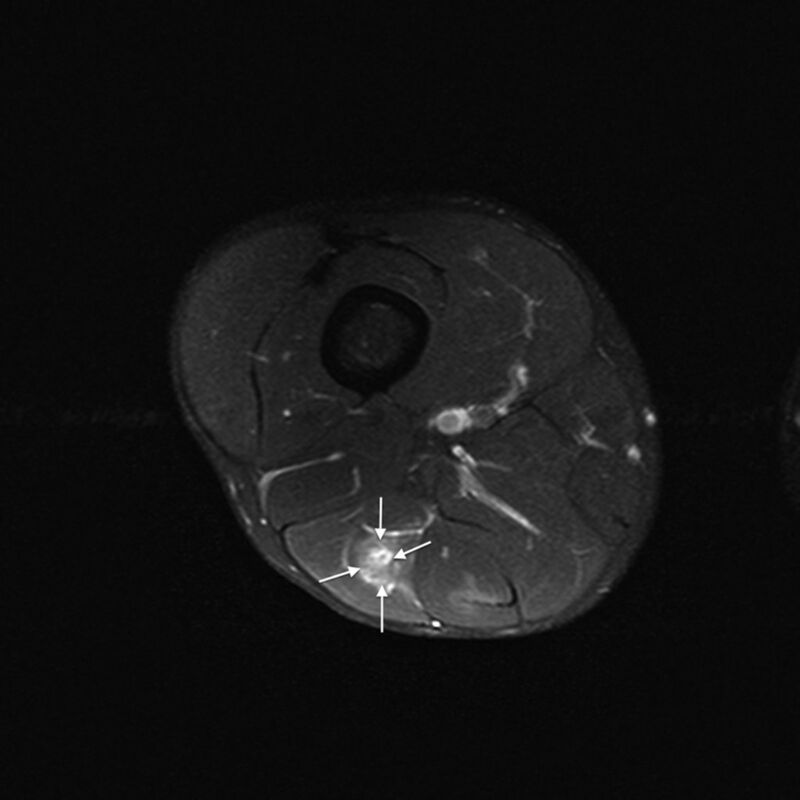 Axial T2-weighted image with fat saturation showing interfascicular oedema (arrows) centrally reflecting grade 1 injury, in the long head of biceps femoris. Given the player's history of lower back pain, symptoms of ‘tightness’ on the right side and a feeling of general restriction throughout the lumbar spine, an epidural corticosteroid injection was performed at L4–5 followed by 2 days of complete rest from physical activity. Postinjection the player reported a general improvement in his feeling of ‘freedom’ on the right side and felt able to swing his legs through fully into hip flexion when running for the first time since the onset of hamstring stiffness on return to preseason training. However, following a long drive (>3 h) 5 days later he reported a return of his posterior thigh and lumbar spine restriction. He was treated similarly to the initial injury, RTT 10 days postinjury and RTP 21 days postinjury, playing a full preseason friendly game without incident. Five days later he started another pre-season game. After 5 min, he sprinted with the ball and crossed the ball with a whipping action and immediately felt some tightness in his hamstring, without an associated feeling of tearing or pain, and was thereafter unable to sprint with confidence. He left the pitch and again presented clinically with a grade 1 injury. Subsequent MRI was reported as a small grade 2 injury (figure 3). This injury was again within the long head of biceps femoris muscle, at a similar level, but not continuous with the site of any previous injury. 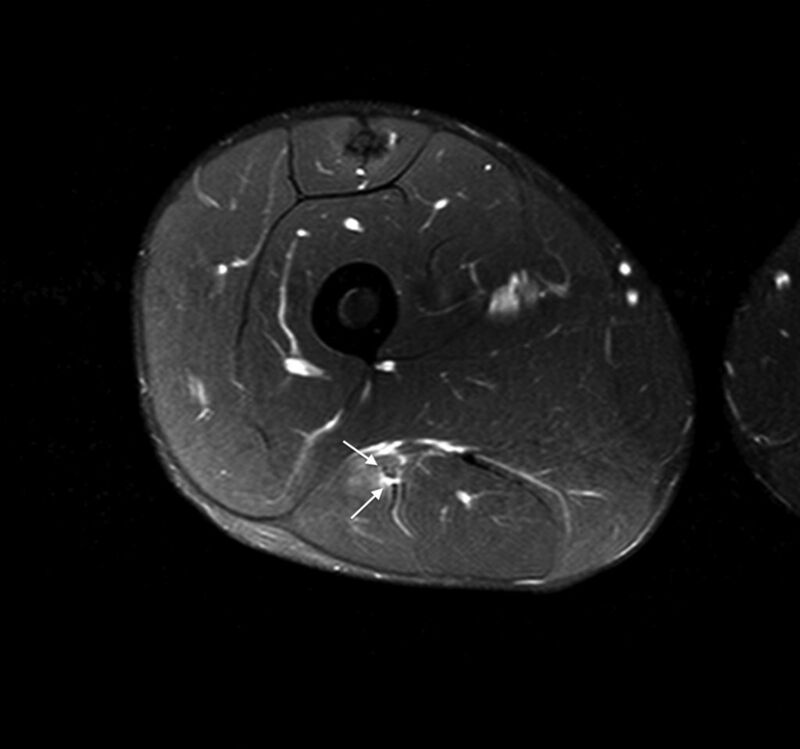 Axial T2-weighted image with fat saturation showing small region of muscle fibre disruption (arrows) reflecting grade 2 injury, involving the long head of biceps femoris with myofascial oedema. After this fourth episode the player underwent a more prolonged and intensive rehabilitation which included progressions based on the percentage of normal running activity in a game (accelerations, repeated efforts, total distance and high-speed distance). The strength programme had an even greater bias on eccentric hip and knee dominant hamstring strength exercises. He RTT 25 days postinjury and RTP 34 days postinjury as a substitute coming on late in the game. Despite extensively warming up prior to joining the play, after 2 min he accelerated at medium intensity and felt some hamstring pain. He played the few remaining minutes but was unable to sprint. Clinically, he presented with a grade 2 strain but MRI showed only a small myofascial tear (figure 4). The player had completed a full week's training prior to this game including repeated maximal sprinting and match play situations at full intensity. 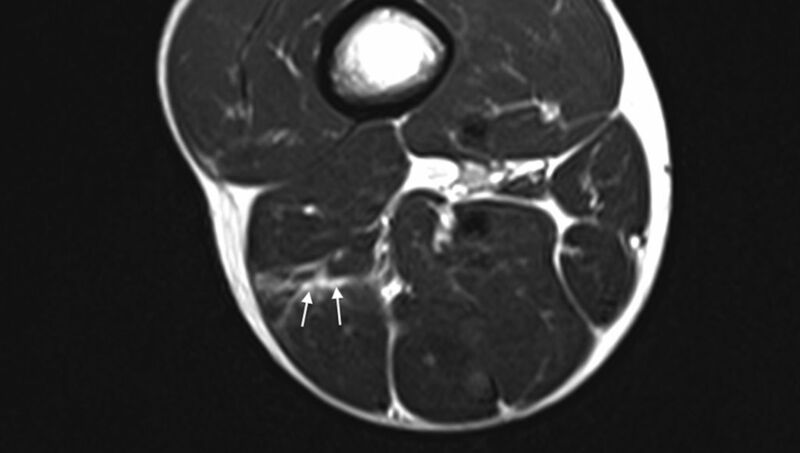 Axial T2-weighted image showing interfascicular and myofascial oedema (arrows) reflecting grade 1 injury, involving the long and short heads of biceps femoris. At this stage, the player had sustained five hamstring injuries in 5 months, none very severe clinically, all of which had undergone a routine yet comprehensive rehabilitation and graded RTP programme that had been successful with other players. Table 1 summarises the episodes of hamstring injury. Between the fifth episode and RTP, a number of additional investigations were performed, including a standard lumbar and posterior thigh MRI; an upright lumbar MRI with standing, sitting and lumbar flexion views and nerve conduction studies, all of which were normal. Isokinetic assessment was conducted 22 days after the final episode using a Biodex 3. After familiarisation, the player completed five maximal efforts of concentric knee flexion and extension from 0° to 90° knee flexion at 60°/s. The results demonstrated right hamstring strength>left (142 Nm vs 128 Nm, 10% asymmetry); right H/Q ratio<left (0.57 vs 0.62) and right peak torque angle>left (24° vs 23°). The clinical challenge was to identify and address any possible factors that may have contributed to the recurrences, and to review and modify the rehabilitation programme accordingly. Potentially relevant risk factors and modifiable hamstring muscle properties are noted in table 2. It was decided early in this injury management to prolong the rehabilitation period to enable a higher volume of intervention and loading. Given the lack of evidence on known univariate risk factors, we investigated a range of other issues that the available evidence and our collective clinical experience suggested may be contributing to elevated risk of reinjury. A biomechanical assessment included review by a sports podiatrist. Significant findings included asymmetrical ankle joint dorsiflexion (L=7.5 cm vs R=9 cm on dorsiflexion lunge testing)45 ,46 and a positive Trendelenburg sign47 on the right side with associated internal femoral rotation on treadmill gait analysis. Pelvic assessment was suggestive of a slight anterior rotation of the right ilium with associated functional leg length discrepancy (left approximately 5 mm longer than right). The player was fitted with custom-made semirigid orthotics to address the 5 mm leg length discrepancy. They were worn in both trainers and football boots from the start of the rehabilitation programme. Specific hip abductor and lateral trunk strengthening exercises were increased into his programme. Osteopathic manual therapy was started aiming at achieving a sustained resolution of the anterior tilt of the right ilium. Initial manipulation of the ilium was performed by an osteopathic specialist in Germany. Further sacroiliac joint (SIJ) manipulation was undertaken on a weekly basis and combined with specific stretches of the posterior chain. Other manipulations performed included right anterior astragalum (anterior-external position), anterior fibula head, internal hip, anterior iliacum and horizontal sacrum, T11-L2, T7-C1 level and first rib (right side) and occipital-C1-C2. Although adverse neurodynamic signs were not objectively identified clinically or radiologically—SLR and slump test had at all times been consistently equal and within normal ranges as were repeated normal lumbar MRIs—the player continued to complain of symptoms consistent with a neural contribution to his presentation. Relevant complaints included prolonged sitting, especially while driving, causing numbness and aching in the right buttock and posterior thigh. The player also complained of a ‘general restriction’ in the right side during swing phase of high-speed running and kicking, and an asymmetrical feeling of heaviness on the right side when fatigued. These symptoms were addressed in two ways. The first epidural (L4/5) resulted in an immediate resolution of these neural symptoms. However, the player felt that the effect wore off after 4–5 days which coincided with a long car journey in which the player had been sitting for 3 h. It is unclear whether the effect of the epidural had indeed worn off rapidly, or if it had been mechanically counteracted by sustaining the provocative sitting and flexed position. Due to the initial success of the epidural and unknown influence of the prolonged sitting and flexion on negating its effectiveness, a second epidural was performed between the fourth and fifth episodes, with a more prolonged rest period followed by strict instructions on avoiding any periods of prolonged sitting. The initial rehabilitations included mobilising the neural structures within the posterior thigh via sliding techniques48 complemented by mobilising and releasing areas along the course of the sciatic nerve. This included passive accessory mobilisation and manipulation of lower lumbar segments, manual release and stretching of the hip rotators, intermuscular mobilisation of the hamstring muscle group and mobilisation of the proximal tibio-fibular joint due to its close proximity to the common peroneal nerve. As these techniques were components of the previous failed rehabilitations, a more aggressive neural mobilisation approach was started incorporating an SLR-biased technique sensitised with internal hip rotation, adduction and dorsiflexion. This was applied daily with a dosage of 3×10 repetitions. The player's core stability programme was redesigned. The programme included a combination of global core type exercises; control exercises with an emphasis on transversus abdominis and internal oblique recruitment and reformer-based Pilates exercises with the aim of combining lumbopelvic control with dynamic recruitment of the hip extensors and hamstring muscles. The player continued to participate in the squad injury prevention programme, a multistation session conducted twice per week before training. These sessions comprise a circuit of proprioceptive, neuromuscular control, core stability/strength and a varied lower limb strength exercise. Core strengthening was supplemented using Document Based Care (DBC; www.dbc-clinic.com) core strengthening machines which have been designed to isolate the specific muscles involved in trunk core stability through a series of specific loaded exercises incorporating the main global lumbar movements (extension, rotation, flexion and side flexion) while limiting movement and activity in the muscles around the hips and thoracic spine. Exercises on the DBC machines were completed every other day from week 2 of the rehabilitation. Eccentric strengthening should form an essential part of any hamstring rehabilitation programme19 ,49 and the player was exposed to this early in all the rehabilitations. Initially, this was in the form of manual eccentric strengthening exercises completed prone on the plinth in three sets of six repetitions with maximal pain-free effort. From week 2, the player completed a 1-in-3 day-strength programme which included both hip and knee dominant hamstring exercises. The programme included double and single leg reverse dead lifts, Nordic hamstring exercises with variations of hip angle, high box step ups, YoYo flywheel hamstring exercises50 and slide board hamstring curls in a bridge position. In the final ‘failed’ rehabilitation, the player completed 11 strength sessions; in the latter rehabilitation the number of strength sessions was similar (12) with a similar volume of eccentric strength exercises. The significant difference was an increase in the number of exercises which focused on faster speed of contraction at longer hamstring muscle lengths such as drop lunges (hip dominant) and single leg cable sprinter kick outs (knee dominant). Hamstring rehabilitation protocols typically involve incremental progression of running speed with supplementary conditioning when appropriate. The total running and non-weight-bearing training load is usually progressed based on standard weekly training distances and high-speed running intensities. During the player's previous HMI, this type of running progression was administered, with the player RTT after completing various objective assessments. Running load was significantly increased during this latter rehabilitation. The programme was designed to overload the player with high-speed running to provide greater exposure to excessive eccentric loads during this specific movement.51 It comprised eight sets of 3 day cycles with consecutive days of running followed by a day of ‘off legs’ conditioning (pool training). The first of the two running days was progressed over the 24-day period based on both the maximum running speed and the player's individual training and match high-speed running and accelerations/deceleration requirements. The second of the two running days was a submaximal running session based on the player's maximal aerobic speed (MAS).52 This session (4×8×100 m at 120% MAS or 6 m/s) was, therefore, conducted eight times and this not only improved the player's aerobic running power but also served as a regular fitness test. As the session was standardised, close heart rate (HR) and Heart Rate Variability (HRV) monitoring determined the player's adaptation to this standard protocol during the rehabilitation. Table 3 demonstrates the programme. The programme was monitored using GPS tracking which provided data on variables including total distance, number of high-speed efforts, high-speed metres and accelerations/decelerations during training sessions.53 In conjunction with video-based tracking of matches (Prozone), this provides an objective measure of each player's ‘standard week’ in terms of training and match loads. From this standard week incremental load percentages can be calculated. The player consulted an international physician 5 days after the last episode. The physician concluded that this HMI was not serious and that abnormalities in the lumbar region were contributing to the reinjuries. He injected a number of sites with local anaesthetic followed by a mixture of Traumeel and Actovegin. Injections were performed in the lumbar regions centrally, over the facet joints and the iliolumbar ligaments bilaterally and the right SIJ. Three similar injections were administered into and adjacent to the HMI site. The player started regular sessions of yoga-based stretching and relaxation with a qualified DRU yoga instructor. These consisted of DRU fascial warm-up techniques; intense hamstring and low back stretches; guided DRU relaxations and DRU breath training (techniques to improve lung capacity, stamina and to activate the relaxation response through the body). Sessions were undertaken for 60 min twice per week. The player soon reported subjective improvement in his hamstring freedom. The player RTT 33 days postinjury and was deemed available for selection in 39 days. He then RTP 42 days postinjury. He played 33 out of a possible 42 games until the end of the season. He missed seven games with a ruptured plantaris but did not miss any due to hamstring problems. He continued this treatment regime at maintenance level during this period. Right Achilles tendinopathy pain earlier in the season may have resulted in altered running mechanics and reduced plantar flexor power though this was not specifically measured. The player had proximal left hamstring pain 17 months prior reporting a similar feeling of ‘restriction’ during swing phase when high-speed running. Investigations of the lumbar spine at that time showed no abnormality and he was diagnosed with proximal hamstring tendinopathy. The symptoms of pain soon resolved, but a feeling of ‘restriction’ persisted for approximately 1 year. Seven interventions were performed following the fifth episode of HMI. There are varying degrees of evidence for these interventions. A significant association between functional leg length asymmetries of greater than 1.8 cm and approximately four times greater risk of HMI has been demonstrated in professional footballers.56 Leg length asymmetries have also been associated with innominate bone rotation, anteriorly on the side of the shortened and posteriorly on the side of the lengthened limb57. SIJ dysfunction has also been reported to be associated with gluteal hip extensor weakness in patients with lower back pain, compared with patients with lower back pain without SIJ dysfunction.58 Elite sprinters who subsequently sustained HMI also demonstrated reduced concentric hip extensor strength relative to uninjured sprinters.59 These findings suggest that there may be a relationship between SIJ dysfunction, gluteal hip extensor weakness and HMI. Despite treatment restoring the normal load transfer patterns on dynamic pelvic girdle testing during active straight leg raise in supine60 and in weightbearing,61 ,62 the player consistently demonstrated a small leg length asymmetry. Despite this asymmetry being considerably less than 1.8 cm56 and within normal variance and measurement error,63 ,64 given the circumstances of the player's recurrent injury history, custom-made orthotics were prescribed to correct this asymmetry. They were immediately well tolerated and remain a component of the player's overall management regimen even though their specific effect is incalculable. The anatomical relationship between biceps femoris, which is also the most commonly injured of the hamstring muscles,65 and SIJ stiffness has been demonstrated.66–69 Several authors have also demonstrated the relationship between SIJ dysfunction and alterations in load transfer throughout the pelvis via leg asymmetries during walking,70 altered muscle activation timing and strength including earlier hamstring activity onset during functional movements and compromised pelvic stability.58 ,71 ,72 Subjects recovering from HMI have similarly been shown to demonstrate earlier hamstring activity onset when preparing for single leg stance,73 suggesting a common trend of altered neuromuscular control between patients with SIJ dysfunction and hamstring injury. Asymmetries in hip joint ROM have also been associated with SIJ dysfunction in patients with lower back pain83 and pelvic innominate tilt has been reported to alter following SIJ manipulation.83 Future research is proposed to investigate the effects of a pelvic belt on injured hamstring function.84 Despite the current lack of clarity in the evidence, the theoretical basis for manual therapy to treat clinically diagnosed SIJ dysfunction justifies consideration in the management of the player with HMI. Adverse neural tension, defined as a positive slump test86 reproducing the player's posterior thigh pain, subsequently reduced by cervical extension, was present in over half of a sample of rugby union players with a history of two or more clinically diagnosed grade 1 HMI in the past 2 years. This contrasted with no positive tests in age, gender and rugby position-matched control subjects.87 Despite this there was no difference in hamstring flexibility between groups. The authors suggested that the proximity of the sciatic nerve to the hamstrings implicates scarring potentially compromising the normal mobility and nutrition of the sciatic nerve. This suggests that clinical signs of adverse neural tension, or more aptly ‘neurodynamics’ as proposed by Shacklock,88 can persist beyond functional recovery. Shacklock88 suggests that the primary mechanical fault in the subject with positive neurodynamic tests may be one of ‘reduced sliding (neural sliding dysfunction)’ which implies a lack of mobility rather than excessive tension. Despite the player consistently demonstrating clinically acceptable symmetrical ranges and absence of symptoms on SLR and slump testing, his history and symptom of a ‘lack of freedom’ when running at high speed suggested a neural component to his presentation. Following the most recent HMI more aggressive and frequent neural mobilisation techniques were included in the player's management regimen, particularly immediately prior to training and playing. The rate of MRI-negative scans for clinically diagnosed HMI ranges from 14% to 45%.12 ,17 ,27 ,35 ,65 ,90–92 This relatively common clinical presentation implies a referred posterior thigh pain subgroup of HMI.27 The origin of the neural supply to the hamstring and posterior thigh implicates the lumbar spine and its neurodynamics to the lower limb as a potential source of pain referral and injury risk. While the effectiveness of such injections seems greatest in athletes with MRI-negative hamstring or lower limb muscle injury presentations, the frequency and minimal clinical and radiological grade of the HMI sustained by the player, in our opinion, warranted management with lumbar epidural steroid injection. This was undertaken following his third injury. On returning to running 4 days postinjection, during which time he had rested from all physical activity and avoided any sustained sitting, the player reported immediate and complete relief of his symptom of ‘lack of freedom’ during swing phase of running. However, an unavoidable long drive the following day corresponded to a return of his posterior thigh ache when sitting and during his next running session the day after he reported his ‘lack of freedom’ again. This sequence further indicated a mechanical relationship between his lumbar spine and running symptoms and hence the epidural injection was repeated at the next available opportunity. Although the optimal dose, grade and vertebral levels of lumbar manual therapy require further investigation and the mechanisms by which the increase in SLR ROM96 and SNS stimulation98 are unknown, this evidence suggests that beneficial effects from this intervention are possible. Such manual therapy has been an integral component of the player's pretraining and match routine throughout and since his rehabilitation and is reported to provide improved freedom of lumbar and lower limb mobility. Such research findings suggest that improvements in lumbopelvic control can reduce demands on the hamstrings, especially biceps femoris, and subsequently, injury. The player's ongoing programme incorporated all components of the programmes suggested to be effective in preventing reinjury and minimising demands on the hamstrings. A localised approach to core strengthening with the utilisation of DBC machines104 ,105 complemented this programme. In conjunction with functional exercise, isolated strengthening of the trunk muscles was also undertaken with the goal of optimising the rate and gain in ‘core strength’. Eccentric exercise is the most researched means of achieving changes in hamstring muscle properties and reductions in HMI rates. While the 2010 Cochrane Collaboration systematic review on hamstring injury prevention106 concluded that there was insufficient evidence to draw conclusions on the efficacy of interventions used for preventing hamstring injury in football, its inclusion criteria is perhaps too strict to dismiss the findings of excluded research from clinical practice. Several studies have investigated the effect of various forms of eccentric exercise on HMI rates in sport,4 ,14 ,50 ,107–111 strength50 ,110 and optimum angle measured on isokinetic equipment.36 ,112–115 The vast majority reported significant effects on their respective outcome measures. Previous HMI has been associated with reduced eccentric hamstring strength and biceps femoris EMG activation towards full knee extension in athletes who have returned to training for their sport.116 It has also been associated with shifting optimum angle towards greater angles of knee flexion compared with the uninjured leg,113 ,117 which is the opposite effect to eccentric training.36 ,112–115 Given that previous HMI is a strong risk factor for future injury,3 ,14 ,15 ,23 ,26–28 ,32 ,33 altered muscle properties such as these may contribute to this risk. Croisier31 demonstrated in a large prospective study of professional footballers that preseason normalisation of strict strength imbalance criteria that included bilateral asymmetry and various H/Q ratios reduced injury rates to that of non-imbalanced players. The discriminatory benefits of eccentric testing were also demonstrated with over 30% of players identified as imbalanced exclusively on this basis. Unfortunately, the optimum angle was not included in this study. Similarly, the normalisation of isokinetically determined strength deficits in 17 of 18 athletes with recurrent HMI was associated with a zero recurrence rate in the subsequent 12 months.124 These findings indicate that isokinetically determined imbalance criteria can prospectively identify players at higher risk of subsequent hamstring injury and that the normalisation of such criteria, irrespective of the form of exercise undertaken to achieve this, can significantly reduce hamstring injury rates. Following the isokinetic test, the player completed a further six strengthening sessions, two high-speed running sessions and six team training sessions prior to RTP. While isokinetic testing was not repeated immediately prior to RTP, it is reasonable to expect that his isokinetic profile would have continued to improve as a result of this training. Continued optimisation of such factors remains a focus of the player's management indefinitely beyond his RTP. Recent ‘incontrovertible’49 evidence demonstrated ‘spectacularly good’49 results in reducing both injury and recurrence rates in footballers with an eccentric Nordic hamstring exercise programme. New injuries and recurrences were reduced by 60% and 85%, respectively. The number needed to treat to prevent one injury (new or recurrent) was only 13 and to prevent one recurrence was only 3. No injuries were sustained during the exercise and there was no increase in the injury rate during the intervention period. The lack of significant decrease in the injury rate during the intervention period indicates that a critical volume of exercise needs to be reached before its effects are realised. However, once this volume is reached the effects were highly substantial. The authors suggest that the shift in optimum length, previously shown to be achieved by eccentric exercise and this particular exercise,36 may be the mechanism by which such favourable effects were achieved. The Nordic hamstring exercise also has its criticisms including being bilateral and thus potentially promoting existing asymmetries and that it is a single joint exercise, whereas biceps femoris which is the most commonly injured hamstring muscle65 is biarticular.128 It is also typically performed at slow velocity4 ,36 ,109 ,115 and at relatively short muscle lengths until subjects have improved sufficiently to be able to lower themselves to the ground. However, it has been shown to significantly and immediately shift optimum length36 ,112 ,113 ,117 and when performed in sufficient volume also dramatically reduce injury rates.109 Unfortunately, the scheduling within a 6-week English Premier League preseason renders the application of this volume109 of exercise very difficult to implement. The need for eccentric training to be the foundation of muscle injury rehabilitation has already been outlined. However, it is important to note that in the elite sports setting, both in terms of striving to prevent HMI en masse, and within the context of injury rehabilitation, administering sufficient load to the hamstrings is a major challenge. In the context of an HMI rehabilitation which commonly average 3–4 weeks8 the scheduling of optimal exercises and prescription of optimal dose are paramount. While most evidence for changing muscle properties revolves around the Nordic hamstring exercise, its limitations as outlined above demand that other exercises be prescribed for the player with acute unilateral injury. The programme should be progressed not just in terms of resistance and volume but also in velocity, muscle length at contraction and multiple joint motion. A range of such exercises have been outlined in previous studies112 ,113 ,128 and include manual eccentrics in various positions, forward deceleration steps, box drops landing in squat or lunge, eccentric forward pulls, eccentric single and stiff leg dead lifts. Other exercises with similar goals include slideboard leg curls, hamstring catapults, sprinter eccentric leg curls and loaded hip bridges. Pain and acute injury healing may contraindicate resistance exercise for the first 3–5 days and the player should also return to training and playing not in a fatigued state thus requiring recovery time. This can leave time for as few as 5–7 intensive strengthening sessions if conducted every other day should the player RTP on 3 weeks. This player completed 11 strengthening sessions prior to the latter injury. Following this episode, he completed 12 sessions prior to RTP. While a similar number of sessions, the mechanism of injury and clinical presentation of this episode were less severe, enabling a more rapid progression to more functional, multijoint, higher speed and greater length at contraction exercises, such as the hip dominant drop lunges and knee dominant sprinter eccentric leg curls in single leg standing. The player consistently produced greater force on the injured leg with isometric testing measured by a dynamometer in supine at 90° of hip and knee flexion129 and in prone at 15° knee flexion during the latter stages of the latter rehabilitation.15 ,71 Askling's ballistic SLR test130 was also devoid of pain and insecurity. Several imaging studies44 ,65 ,131 ,132 have demonstrated pathological signs and biceps femoris atrophy and increased strain in a significant proportion of subjects up to 2 years beyond RTP. Given that recurrence risk remains elevated for up to a year and that the effects of eccentric exercise have also been shown to be temporary,36 ,114 it is imperative that the player continues his customised, varied eccentric programme indefinitely. Expose the player and his hamstrings to substantially more running load than is required during a typical week then taper just prior to RTT. This was administered to achieve physiological and psychological benefits while recognising that the match situation and its associated sympathetic responses and injury risk being 15 times greater than training11 cannot be readily simulated. The player's physical condition required improvement after repeated disruptions to training in recent months. The player's HR and HRV scores had been disproportionately high relative to his training load. Extra conditioning had been prescribed during this period however the player was still required to play matches and therefore the volume of conditioning had to be adjusted. A period of overload training provided an ideal opportunity to address this. The results of this programme can be seen in table 4. The high-speed running volume was 49.8% higher in the overload rehabilitation programme than the previous rehabilitation programmes despite a moderate 16.8% increase in training time between the protocols. The player was also not selected to play by the management when he was first declared available and so may have benefited from an extra week of team training prior to RTP. Actovegin and Traumeel injections for treating muscle injuries are routine practice in German sports medicine. Actovegin is reported136 to promote acceleration of muscle fibre synthesis in damaged muscle and de-toning of the hypertonic muscle bundle. Traumeel S, a homeopathic formulation, is alleged137 to suppress the release of inflammatory mediators and stimulate the release of anti-inflammatory cytokines. There have been no controlled trials138 into either substance for the treatment of HMI. Reduced HMI time to RTP was reportedly associated with Actovegin injections in professional footballers139 though methodological flaws compromise the interpretation of outcomes of this pilot study. However, there is not likely to be any harm in administering either substance.140 While striving for the most comprehensive intervention and rehabilitation programme possible, the player consulted an acclaimed sports medicine physician and underwent a series of such injections. At the very least this had the psychological effect of ensuring the player felt he was provided with all interventions for which expert opinion suggests any benefit. While evidence regarding hamstring flexibility as a risk factor for HMI remains ambiguous.3 ,14 ,23 ,25 ,32 ,126 ,127 ,141–143 higher stretching frequency during rehabilitation was associated with earlier restoration of AKE ROM and reduced time to RTP.144 Soft tissue healing theory145 also advocates stretching within the treatment regime to maximise scar extensibility. Maximum hamstring muscle lengths are reached during terminal swing phase of high-speed running with increasing speed beyond 80% only affecting the moment and speed at which it occurs.123 ,146 Given that the moment of maximum length coincides with the highest risk phase of the gait cycle118–120 ,122 and that prior HMI increases mechanical strain at the proximal biceps MTJ even at relatively low eccentric loads,132 it is essential that optimal tissue extensibility is restored. Dru Yoga is shown to be effective in the treatment and management of low back pain and stress.148 ,149 Whether the relaxation or stretching is contributing the most benefit remains unknown. We have presented a seven part intervention strategy for the management of recurrent HMI in one player. Whether any one of these interventions was the key factor in the success of this rehabilitation is impossible to determine. There are varying levels of evidence for every individual component of this treatment regimen. This gap between the evidence base and the reality of clinical practice and its variable outcomes intensifies the pressure on clinicians working in professional sport and invites the temptation of speculative interventions. The clinician is obliged to deliver interventions based on the evidence that is available in its varying levels and forms. This is true for the management of many injuries encountered in sports medicine and medicine generally. Our profession must acknowledge this inadequacy and pursue the evidence essential to overcome it. A new rehabilitation protocol is proposed for the management of recurrent hamstring injuries. This paper will help clinicians in determining the rehabilitation protocol for a recurrent hamstring injury.
. Injuries to elite male cricketers in Australia over a 10-year period. J Sci Med Sport 2006;9:459–67.
. The development and application of an injury prediction model for noncontact, soft-tissue injuries in elite collision sport athletes. J Strength Cond Res 2010;24:2593–603.
. AFL injury report season. 2011;afl.com.au 2012.
. Hamstring muscle strain injuries: what can we learn from history? Br J Sports Med 2012;46:900–3.
. High-speed running type or stretching-type of hamstring injuries makes a difference to treatment and prognosis. Br J Sports Med 2012;46:86–7.
. Risk factors of recurrent hamstring injuries: a systematic review. Br J Sports Med 2012;46:124–30.
. Clinical risk factors for hamstring muscle strain injury: a prospective study with correlation of injury by magnetic resonance imaging. Br J Sports Med 2001;35:435–9; discussion 40.
. An evidence-based approach to hamstring strain injury: a systematic review of the literature. Sports Health 2009;1: 154–64.
. Reliability and validity of the biodex system 3 pro isokinetic dynamometer velocity, torque and position measurements. Eur J Appl Physiol 2004;91:22–9.
. Reliability of isokinetic strength imbalance ratios measured using the Cybex NORM dynamometer. Clin Physiol Funct Imaging 2008;28:113–19.
. Rehabilitation for hamstring injuries. Cochrane Database Syst Rev 2007;(1):CD004575.
. Therapeutic interventions for acute hamstring injuries: a systematic review. Br J Sports Med 2012;46:103–9.
. Evidence based medicine: what it is and what it isn't. BMJ 1996;312:71–2.
. Brukner and Khan's clinical sports medicine. 4th edn. Sydney: McGraw Hull, 2012.
. Intra-rater and inter-rater reliability of a weight-bearing lunge measure of ankle dorsiflexion. Aust J Physiother 1998;44:175–80.
. The reliability of musculoskeletal screening tests used in cricket. Phys Ther Sport 2008;9:25–33.
. Trendelenburg's test: 1895. Clin Orthop Rel Res 1998;355:3–7.
. Why hamstring eccentrics are hamstring essentials. Br J Sports Med 2012;46:463–5.
. Effect of a 12-weeks training programme on Maximal Aerobic Speed (MAS) and running time to exhaustion at 100% of MAS for students aged 14–17 years. J Sports Med Phys Fitness 1995;35:251–6.
. Validity and reliability of GPS devices for measuring movement demands of team sports. J Sci Med Sport 2010;13:133–5.
. Intrarater reliability of the adductor squeeze test in gaelic games athletes. J Athl Train 2011;46:241–5.
. Hip adduction and abduction strength profiles in elite soccer players: implications for clinical evaluation of hip adductor muscle recovery after injury. Am J Sports Med 2100;39:121–6.
. The effect of imposed leg length difference on pelvic bone symmetry. Spine 1993;18:368–73.
. Altered muscular activation during prone hip extension in women with and without low back pain. Chiropr Man Therap 2011;19:18.
. The active straight leg raising test and mobility of the pelvic joints. Eur Spine J 1999;8:468–73.
. Evaluation of the ability of physical therapists to palpate intrapelvic motion with the Stork test on the support side. Phys Ther 2007;87:879–87.
. Altered patterns of pelvic bone motion determined in subjects with posterior pelvic pain using skin markers. Clin Biomech (Bristol, Avon) 2004;19:456–64.
. Reliability and accuracy of the tape measurement method with a nearest reading of 5 mm in the assessment of leg length discrepancy. Singapore Med J 2011;52:681–4.
. Reliability analysis for radiographic measurement of limb length discrepancy: full-length standing anteroposterior radiograph versus scanogram. J Pediatr Orthop 2007;27:46–50.
. A functional-anatomical approach to the spine-pelvis mechanism: interaction between the biceps femoris muscle and the sacrotuberous ligament. Eur Spine J 1993;2:140–4.
. The function of the long dorsal sacroiliac ligament: its implication for understanding low back pain. Spine 1996;21:556–62.
. The sacrotuberous ligament: a conceptual approach to its dynamic role in stabilizing the sacroiliac joint. Clin Biomech 1989;4:201–3.
. Stabilization of the sacroiliac joint in vivo: verification of muscular contribution to force closure of the pelvis. Eur Spine J 2004;13:199–205.
. Gait analysis of sacroiliac joint patients. J Manipulative Physiol Ther 1994;17:124–7.
. Evidence of altered lumbopelvic muscle recruitment in the presence of sacroiliac joint pain. Spine 2003;28:1593–600.
. Relationship between mechanical factors and incidence of low back pain. J Orthop Sports Phys Ther 2002;32:447–60.
. The relationship between pelvic cross syndrome and chronic low back pain. J Back Musculoskelet Rehabil 2006;19:119–28.
. Normal lumbo-pelvic muscle lengths and their interrelationships in adolescent females. Aust J Physiother 1990;36:105–9.
. Influence of short hamstring muscles on the pelvis and lumbar spine in standing and during toe-touch test. Clin Biomech 1992;7:38–42.
. Successful management of hamstring injuries in Australian rules footballers: two case reports. Chiropr Osteopat 2005;13:4.
. Diagnosis of sacroiliac joint pain: validity of individual provocation tests and composites of tests. Man Ther 2005;10:207–18.
. Unilateral hip rotation range of motion asymmetry in patients with sacroiliac joint regional pain. Spine 1998;23:1009–15.
. Effects of external pelvic compression on form closure, force closure, and neuromotor control of the lumbopelvic spine—a systematic review. Man Ther 2012;17:275–84.
. The role of neural tension in hamstring flexibility. Scand J Med Sci Sports 2012;22:164–9.
. The slump test: examination and treatment. Aust J Physiother 1985;31:215–19.
. Improving application of neurodynamic (neural tension) testing and treatments: a message to researchers and clinicians. Man Ther 2005;10:175–9.
. Hamstring muscle complex: an imaging review. Radiographics 2005;25:571–86.
. Lumbar spine region pathology and hamstring and calf injuries in athletes: is there a connection? Br J Sports Med 2004;38:502–4; discussion 02–4.
. Epidural steroid injection for lumbar disc herniation in NFL athletes. Med Sci Sports Exerc 2012;44:193–8.
. The immediate effect of unilateral lumbar Z-joint mobilisation on posterior chain neurodynamics: a randomised controlled study. Man Ther 2011;16:609–13.
. Mechanosensitivity of the lower extremity nervous system during straight-leg raise neurodynamic testing in healthy individuals. J Orthop Sports Phys Ther 2009;39:780–90.
. An investigation into the effects of a unilaterally applied lumbar mobilisation technique on peripheral sympathetic nervous system activity in the lower limbs. Man Ther 2008;13:492–9.
. Effect of the HamSprint Drills training programme on lower limb neuromuscular control in Australian football players. J Sci Med Sport 2009;12:24–30.
. Stability training of the lumbo-pelvo-hip complex infl uence stiffness of the hamstrings: a preliminary study. Scand J Med Sci Sports 2009;19:260–6.
. A soccer-specific balance training program for hamstring muscle and patellar and achilles tendon injuries: an intervention study in premier league female soccer. Am J Sports Med 2009;37:1384–93.
. The efficacy of active rehabilitation in chronic low back pain. Effect on pain intensity, self-experienced disability, and lumbar fatigability. Spine 1999;24:1034–42.
. Functional rehabilitation of low back disorders. Eura Medicophys 2004;40:29–36.
. Interventions for preventing hamstring injuries. Cochrane Database Syst Rev 2010;(1):CD006782.
. The effects of eccentric hamstring strength training on dynamic jumping performance and isokinetic strength parameters: a pilot study on the implications for the prevention of hamstring injuries. Phys Ther Sport 2005;6:67–73.
. Selective strength loss and decreased muscle activity in hamstring injury. J Orthop Sports Phys Ther 2011;41:354–63.
. Hamstrings are most susceptible to injury during the late swing phase of sprinting. Br J Sports Med 2012;46:90.
. Hamstring muscle strain injury caused by isokinetic testing. Clin J Sport Med 2001;11:274–6.
. Preventing hamstring injuries in sport. NSCA Strength Condition J 2008;30:55–64.
. Straight sprinting is the most frequent action in goal situations in professional football. J Sports Sci 2012;30:625–31.
. Relationship between running loads and soft-tissue injury in elite team sport athletes. Strength Cond Res 2012;26:953–60.
. Treatment of fresh muscle injury. Sportverletz Sportschaden 1990;4:41–4.
. Effect of Traumeel S, a homeopathic formulation, on blood induced inflammation in rats. Complement Ther Med 1999;7:225–30.
. Our experience on Actovegin, is it cutting edge? Int J Sports Med 2011;32:237–41.
. Treatment of symptomatic polyneuropathy with Actovegin in type 2 diabetic patients. Diabetes Care 2009;32:1479–84.
. The relationship between preseason range of motion and muscle strain injury in elite soccer players. J Strength Condition Res 2007;21: 1155–9.
. Assessment of the flexibility of elite athletes using the modified Thomas test. Br J Sports Med 1998;32:68–70.
. The effectiveness of yoga for the improvement of well-being and resilience to stress in the workplace. Scand J Work Environ Health 2011;37:70–6.
. Yoga for chronic low back pain: a randomized trial. Ann Intern Med 2011;155:569–78. Contributors PB coordinated the treatment programme and with AN was the main author of the paper. CM and DB were involved in the management of the patient and contributed to appropriate sections of the paper. AD was the radiologist involved in the management of the patient and provided the images.